We all want our yards to look beautiful. However, most of us lead busy days and don’t have much time for yard work. Some things also require certain expertise. Do you know the signs that a tree in your yard needs trimming? If not, watch out for the following. 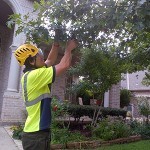 If you notice these signs, call Integrity Tree Care for our tree trimming/pruning services. Hanging branches can obstruct movement through your yard. On top of that, if they start messing with your houses wiring or fall on top of your roof they can cause a lot of damage. Contact a professional to determine whether they should get cut down. If branches on your tree have started dying, you’ll want to contact an arborist right away, as it can lead to the spreading of disease throughout the tree. While you definitely want some shade inside, especially in the Texas heat, you want some sunny spots too. If your trees take them all up, you can remedy that with tree trimming services. Watch out for these in your yard. If you notice these signs, contact Integrity Tree Care for our premium tree trimming/pruning services. To find out more about us, please give us a call at (817) 714-1777 or (214) 971-1618.